The Smurl Poltergeist & haunting; All the details! For 13 years (1974 -1987) on Chase Street in West Pittson, Pennsylvania, an ordinary family encountered something they couldn't explain, and couldn't free themselves of. Their story became famous when the media became involved, and their ordeal was told in a book and a movie, each titled "The Haunted." It began when Jack and Janet Smurl moved from Wilkes-Barre Pennsylvania to escape the flooding damage left behind from hurricane Agnes in 1972. In 1973, they moved into a duplex Jack's parents had purchased, sharing the house with them. Jack and Janet and their two daughters, Dawn and Heather lived in one half, and Jack's parents lived in the other. The house had been built in 1896, and was on a quiet street in a middle class, ordinary neighborhood. The living arrangement was a happy one. Jack and Janet had been raised in Catholic homes, and they and Jack's parents were strong in their religious faith. They were (and are) a close loving family who enjoyed sharing the house. They did some remodeling and redecorating work on the house, settled into it, and Jack and Janet added twin girls Shannon and Carin to the family. It started out as minor but puzzling annoyances and incidents. A mysterious stain appeared on a new carpet in the house that apparently could not be removed; deep scratches appeared on new bathroom fixtures in a remodeled bathroom; there were problems with leaking pipes in spite of repeated repairs to them, and a television set suddenly caught fire. Over time, the incidents became more alarming and frightening. Jack and Janet's daughter Dawn claimed she saw floating people in her bedroom. Drawers began to open and close by themselves, the sounds of footsteps on the stairs, unplugged radios would suddenly begin blasting loudly, and the toilets would flush themselves. Whatever the cause, the incidents continued to worsen. Horrible stenches would waft throughout the house, and Jack felt something physically touch him several times. The 'poltergeist' was appearing to be more and more demonic as time went on, and by 1977, it was apparent that the Smurls were facing more than unexplained annoyances. 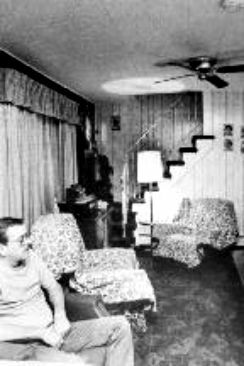 The phenomena wasn't confined to Jack and Janet's side of the duplex; Jack parents, John and Mary were also subjected to frightening events. The house would become icy cold, and they would hear what appeared to be violent verbal fighting on Jack and Janet's side of the home, with abusive, foul language. Even neighbors were affected by the phenomena plaguing the Smurl family. Screams and loud noises were heard coming from the house, even when no one was home. Not all the neighbors were sympathetic, however. Some claimed the Smurls' story to be false, accusing them of trying to make money through book and movie deals about their 'haunted' house after the media became involved. Someone called Janet's name to her when she was in her basement tending to her laundry - she replied at first, and tried to find who was calling her, in the end realizing that she had been alone in the house. As if this were a catalyst, the force invading the Smurl house grew bolder and stronger shortly afterwards. A black human shaped form manifested in Janet's kitchen, moving through the wall and into John and Mary's side of the duplex, where Mary also witnessed the phenomena. Physical violence towards the family began and escalated. Even the pet German Shepherd was tormented, picked up and thrown repeatedly. Shannon was thrown down a flight of stairs, and a ceiling fan crashed down inches from her, barely missing hitting and injuring her. Janet was levitated and thrown, and there was continuous rapping and scratching heard within the walls. Ed and Lorraine Warren were contacted by Janet in 1986 for help. The Warrens are well known psychical researchers and demonologists, who have also investigated the Amityville house in Long Island. Janet had heard about them, and in desperation asked them for help in spite of her skepticism. The Warren's interviewed the family and investigated the house. Their conclusion: of the 4 entities in the home, one was demonic. Efforts to force the demon to expose itself failed, instead resulting in additional violence from the entity. The only thing that seemed to provide a cessation of the activity were Holy Water and prayer. The attacks upon the beleaguered family continued, growing worse in violence and intent. Jack and Janet suffered sexual attacks; and their daughter Dawn was nearly raped by the entity. Mysterious illnesses afflicted Carin Smurl and Ed Warren; Janet and Mary Smurl suffered bites and slashes on their arms. When the Smurls' attempts to involve the Roman Catholic Church for help failed, the Warrens brought in Father McKenna to perform an exorcism, but this only angered the demonic entity. McKenna performed a second exorcism, which also failed. Attempts to get away from the entity were also unsuccessful. The family was followed on a camping trip; and Jack was even tormented at work. In desperation, the family decided to turn to the media for help. The resulting press coverage opened the floodgates, and the Smurls' home became a tourist attraction, press magnet, and forum for skeptics. After repeated refusals by the Church to become involved, the media coverage finally motivated the Scranton diocese to offer an investigation into the Smurls' case. A third exorcism performed by Father McKenna brought an end to the activity. In December 1986, however, after only 3 months of freedom from the torture, Jack saw the dark form beckoning to him. Once again the phenomena began. The Smurls moved out of their house and to another town, and the book was published shortly afterwards.